Robert Mostyn thinks of himself as a conduit, connecting game developers, programmers, designers, artists and musicians to others within the community. 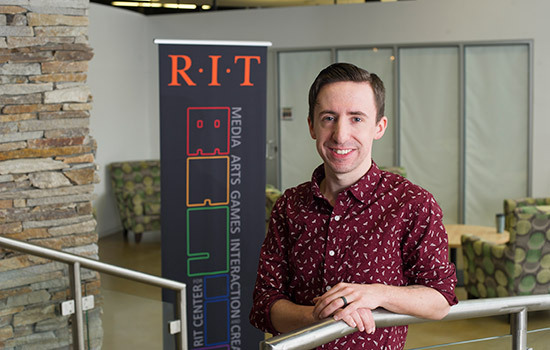 Through his work as the Digital Games Hub Coordinator at RIT’s MAGIC Spell Studios, he’s helping to keep talented professionals in the area and grow New York state into a focal point for game development on the East Coast. Last year, RIT was named one of three Digital Gaming Hubs in New York by Empire State Development. The designation, which includes Rensselaer Polytechnic Institute and New York University, drew Mostyn to RIT after years in the graphic design industry and as a musician working with local game developers to add music to their digital creations. Today, he spearheads MAGIC Spell Studios’ efforts to foster innovation and collaboration resulting in the creation of new games or companies, and develops mentorship opportunities that enable students and entrepreneurs to enter the growing games industry. This spring, Mostyn was the driving force behind the first-ever New York State Game Development Challenge, a statewide competition to identify the next great game developer. As founder of the Rochester Game Developer meet-up group, he became a trusted source of information for those with similar interests within the local gaming community, and he enjoys networking with seasoned industry professionals and newbies, alike. And while Mostyn admits there is much work to do, he is pleased with the progress that’s been made and the opportunity to play a role as a difference maker. “Whenever I discover a new studio or game here in Rochester, I know that we’re heading in the right direction as a digital gaming hub and community,” he added. “And I’m so fortunate that what was once considered a hobby has evolved into my career. Isn’t that what everyone strives for?” he added. What I like best about working at RIT: RIT’s culture has this uncanny ability to attract and support individuals with seemingly endless amounts of passion.